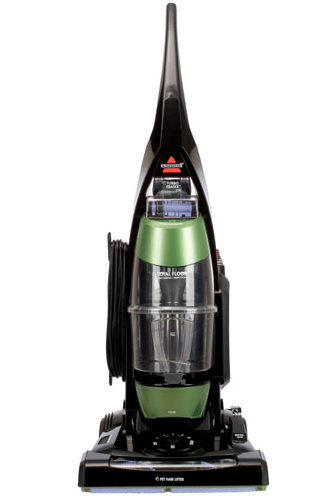 Thanks to BISSELL Canada, Shasher’s Life is giving away one (1) Total Floors® Complete Vacuum to one (1) of my Canadian readers! This giveaway is valued at $169.99. Powerful, Multi-Cyclonic vacuum with the odor elimination power of Febreze®! Contains brush roll switch to turn off the brush roll for safe use on hard floors. I hate cleaning the living room! I hate cleaning the kitchen. The kids toy room comes in at a close second. I hate cleaning the bathroom most and I really hate vacuuming the stairs! I dislike cleaning the bathroom the most. Our beautiful long haired cat leaves a trail behind her but the carpet is like a big lint brush for her! The basement carpet is a pain for me! I would have to say the kitchen as well. Too many things to clean in there, lol! I do not like cleaning the living room it seems never ending somedays. My golden retriever has access to all the rooms of my house and his hair is EVERYWHERE!!! My vacuum cleaner is on its last legs….I give it quite a workout so I could really use this! I dislike cleaning my bedroom the most, because it is so cluttered. The bathrooms – 2.5 of them! ICK!! The bathroom! This would be a great new thing for when I get my apartment! um… I hate cleaning every room in my house… but if I had to choose just one I would say it is a toss up between the kitchen (because it just NEVER STOPS) and the bathroom (because my sons apparently can't aim). My least favourite room to clean is the living room. It seems like every time I clean it, the mess just comes right back. Bathroom – Just hate dealing with all that grunge…. Definitely the living room. With 3 cats and two dogs that are always in it..lots of animal hair to clean! I hate cleaning the kitchen. The bedroom – I hate getting under the beds/dressers to clean! I find the bedroom the hardest to clean, beds gotta be moved and I don't like it!! Hate cleaning the rec room! Bedroom! My cat spends so much time in our bedroom that I have to vacuum it twice! The kitchen/living room is my fav to clean up. My least favorite room is the living room! Lower laundry room where the cat litter box makes a huge mess! That's why it is now my daughter's chore!! I hate cleaning the kids rooms! I dislike cleaning the kitchen and scrubbing the floors. I don't like cleaning the bathroom. te cleaning the bathroom in the basement! I dont like cleaning the bathroom. My least favourite room to clean is the bathroom. I hate cleaning the spare bedroom. You think it would be easier, because it is an extra room. Everything gets dumped in there. The "great" room, because it's the biggest…and it's not even that big! Nice need one for the new place dont have one, as im all wood floors. new place, new start with a awesome product. I was just looking at a bissell. Love fresh smelling carpets and clean looking ones at that. the kitchen for me, there is just so much, microwaves, counters, fridges, coffee makers, sinks and the list goes on & on!! entrance way, esp, in the spring. The living room! Everything gathers there. My home office….its a catch all for everything and I can hardly move in here and does it ever need vacuuming!! My bedroom is my least favorite to clean right now cause my son's crib and his dresser and the change table are all in there including my bed and dresser, tv and two side tables. It 's crowded. my living room, toys all over! ( 6 feet total) in which they forget too remove their shoes grrrr. Least favourite room to clean is the kids play room. Least favourite room to clean is the kitchen. I'd vacuum my stairs – how the heck does the cat and dog hair combine and make bunnies there? You wouldn't think 3 little dogs would create so many dust puppies…they're everywhere! I hate vacuuming my kitchen. There is always under the fridge and stove to think about – not that I do them, but I think about it…. Loading/unloading dishwasher and countertops in the kitchen, wash pots/pans always seems like such a chore! Oh then there is the crumby kitchen floor!! My daughter's bedroom,It's like a twilight zone. Scary!!! Ahh I would love to win this! We have 3 cats and their fur gets everywhere! I'm not a big fan of the dining room / living room…. My least favourite room to clean in my house is hands down, the bathroom. Thanks for the great giveaway and good luck to all. My least fav room to clean is the toy room!!!!!! I run a home daycare with lots of kids a hamster and a dog it can get pretty messy. That would have to be the bathroom. I hate the bathroom!! my least favorite room to clean in my home is the mudroom, dirt everywhere, clothes , jackets boots and packsacks everywhere! lol bissell makes it easier though! Every room is my least favorite to clean in the house. Dog and cat hair everywhere and with the cyclonic vacuum I have now (special for pets) I have to empty the cup several times before I'm done the vacuuming. I would say the storage room because that is where my cat has her litter box. Thank you very much to you Bissell for such a lovely contest…I just found you on twitter. It is a toss up between the living room and the dining room as they are both carpeted and I run a day home which equals lots of messes! Feeling generous, eh? I hate cleaning the bathroom! !